As I was walking around looking at the different demonstrations at the Union County Mountain Heritage Festival, I heard a very distinctive "boing-boing" sound coming from the 1861 John Payne Cabin. I knew I had to meet whoever was making that sound! Mr. Willis Plott is a man of many talents. He is very skilled at caning chairs, making baskets, and playing the jaw harp. After I introduced myself, Mr. Plott told me that he is from the Gumlog community of Towns County, GA. When asked how long he had been playing the jaw harp and he said, "Well, I'd say about 40 years. It's not as hard as you'd think." 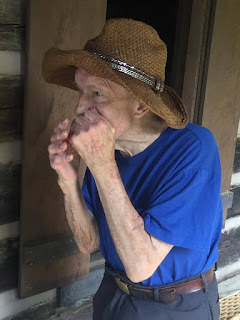 I didn't know a lot about the jaw harp so I was curious to find out more about the history of the instrument and it's role in Appalachian music. Rest your upper and lower lips on the top and bottom of the frame and leave your teeth slightly apart. Pluck the harp while pushing or pulling. While the "tongue peace" is moving, breathe across the instrument while silently pronouncing A-E-I-O-U. This shows you how to create different sounds by changing the size and shape of your mouth. Breathing in different ways and moving your tongue slightly also changes the sound...just like whistling. You would think that you would need to hum but that isn't true. You simply breathe across the mouth piece. 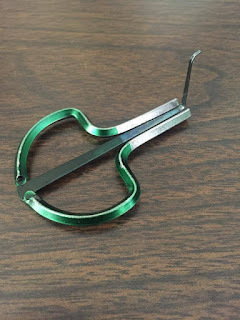 If you would like to purchase your own jaw harp, you can do so here. I'm sure I'll be hearing plenty of "music" as soon as my son figures out how to work mine! Is there anyone you know who plays the jaw harp?